The 2013 Changes to the approval of Training Providers to deliver First Aid at Work and Emergency First Aid at Work now places the onus on employers to satisfy themselves they their chosen provider is both appropriate and credible. Read more about how we exceed those requirements here. Emergency First Aid at Work - a 1 Day course which replaces the "Appointed Person" course. First Aid at Work - a 3 Day courses which covers more serious problems. First Aid at Work Requalification - after 3 years a 3 Day First Aid at Work certificate can be requalified with a shortened, 2 Day, course if completed within 28 days of the original certificates expiry. Annual Refresher - whilst not an obligation, it is recommended that all First Aiders in the workplace attend an annual, 4 hour course to ensure knowledge and skills retention between 3 year retraining. Emergency First Aid at Work or First Aid at Work? The table below summaries the difference in content between the 1 Day and 3 Day courses. 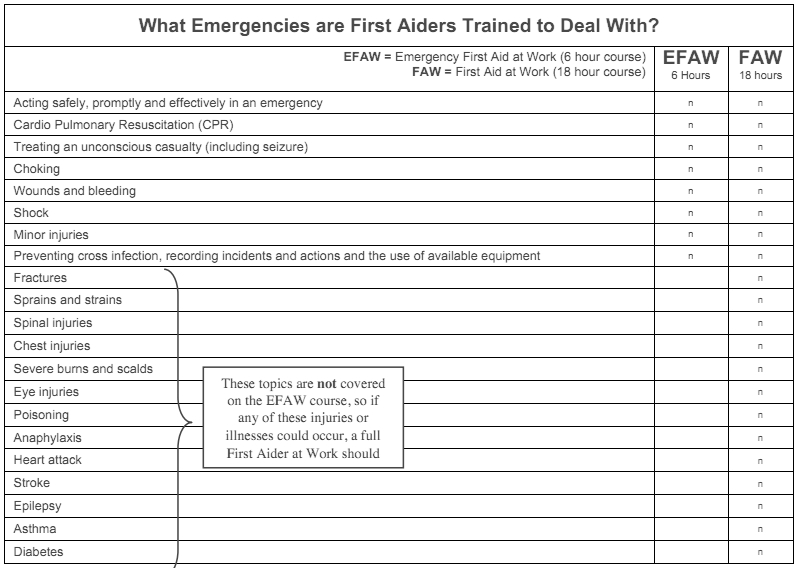 The level of training you require, and number of First Aiders will be determined by your First Aid Needs Assessment. When and how do I requalify? The EFAW course is internally assessed by Continual Assessment. There is no formal assessment process. The FAW course is assessed by Multiple Choice Question paper and an observed practical assessment from an assessor who was not involved in the delivery of the training. Whilst the syllabus is an industry standard, we can tailor specific information to your business whether you work in remote environments, in a office, a laboratory or construction. Contact us to discuss how we can meet your specific needs. Training can be delivered here in Pembrokeshire or at your venue. Because of the practical nature of the course it is ideally delivered with access to the normal or anticipated working environment of the candidates, be that a petrochemical plant, maritime environment or any other high-risk or remote environment. Click here for our on-line calendar to find out our availability.